Synthetic peptide corresponding to residues in Human MBD3 (UniProt O95983). HeLa, 293T, fetal brain and Y79 lysates; HeLa cells; Permeabilized 293T cells. Our Abpromise guarantee covers the use of ab157464 in the following tested applications. WB 1/1000 - 1/5000. Predicted molecular weight: 33 kDa. Does not bind DNA by itself. 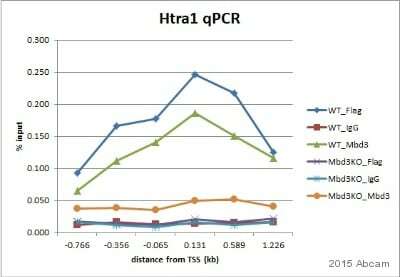 Recruits histone deacetylases and DNA methyltransferases. 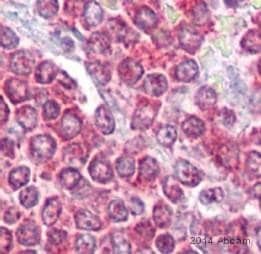 Acts as transcriptional repressor and plays a role in gene silencing. Lanes 1 - 4: Merged signal (red and green). Green - ab157464 observed at 33 kDa. Red - loading control, ab8245, observed at 37 kDa. ab157464 was shown to recognize MBD3 when MBD3 knockout samples were used, along with additional cross-reactive bands. Wild-type and MBD3 knockout samples were subjected to SDS-PAGE. ab157464 and ab8245 (loading control to GAPDH) were diluted 1/1000 and 1/10000 respectively and incubated overnight at 4°C. Blots were developed with Goat anti-Rabbit IgG H&L (IRDye® 800CW) preadsorbed (ab216773) and Goat anti-Mouse IgG H&L (IRDye® 680RD) preadsorbed (ab216776) secondary antibodies at 1/10000 dilution for 1 hour at room temperature before imaging. Immunocytochemistry/Immunofluorescence analysis of HeLa (human cervix adenocarcinoma) labelling MBD3 with purified ab157464 at 1/1000. Cells were fixed with 4% PFA and permeabilized with 0.1% Triton X-100. 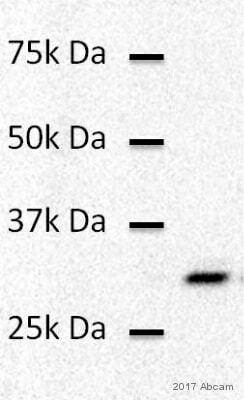 An Alexa Fluor® 488-conjugated goat anti-rabbit IgG (1/1000) was used as the secondary antibody (Ab150077). Nuclei counterstained with DAPI (blue). 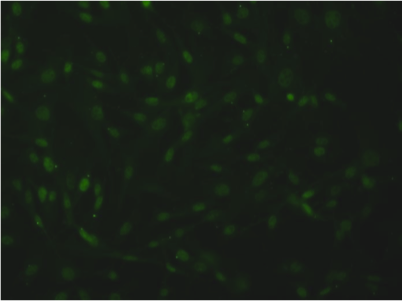 Immunofluorescent analysis of HeLa cells labeling MBD3 with ab157464 at 1/100 dilution. Flow cytometric analysis of permeabilized 293T cells labeling MBD3 with ab157464 at 1/10 dilution (red) compared to a rabbit IgG negative control (green). Immunoprecipitation - Anti-MBD3 antibody [EPR9913] (ab157464)This image is courtesy of an anonymous abreview. Immunoprecipitation of MBD3, using WT and MBD3-/- ES cells (however this was not a 100% pure MBD3 null population). The protein was immunoprecipitated using 1000µg nuclear extract, and 1.03µg of Rabbit polyclonal to MBD3 (ab157464). 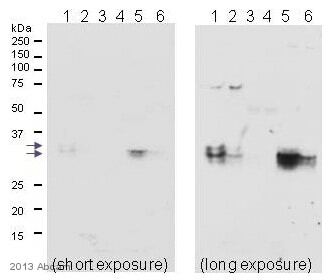 The same MBD3 antibody was used for the western blot. Left blot image taken after a short exposure, right image taken after a longer exposure. Lanes 1, 3 and 5: Mbd3+/+, Lanes 2, 4 and 6: Mbd3-/- (not 100% pure Mbd3 null population), Lanes 1 and 2: Input, Lanes 3 and 4: IP with ab91458, Lanes 5 and 6: IP with ab157464.